^ Koguryo. Encyclopædia Britannica. [June 27, 2017]. ^ 汪高鑫. 东亚三国古代关系史. 北京工业大学出版社. 2006. ISBN 9787563917105. （原始内容存档于2007-02-23）. ^ 杨世新. 略论隋唐朝与朝鲜三国的文化交流. 《大家》. 2010, 7期 [2016-02-22]. （原始内容存档于2016-03-04）. ^ 李岩. 朝鮮三國時期思想文化與佛教的本土化歷程考析. 当代韩国. 2008, 3. ^ 高句丽人哪儿去了. 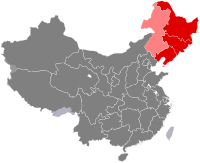 华夏人文地理. 2006, 3. 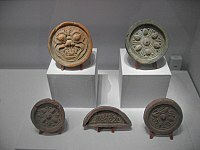 （原始内容存档于2007-06-03）. ^ 郑欣; 刘兆伟. 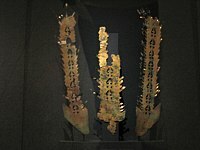 论高句丽、渤海及朝鲜族传统体育文化特点及价值. 辽宁体育科技. 2015, 01. ^ Byington, Mark.“The Creation of an Ancient Minority Nationality: Koguryo in Chinese Historiography.”In Embracing the Other: The Interaction of Korean and Foreign Cultures: Proceedings of the 1st World Congress of Korean Studies, III. Songnam, Republic of Korea: The Academy of Korean Studies, 2002. ^ 江上波夫. 騎馬民族国家―日本古代史へのアプローチ. 中央公論新社. 1991. ISBN 978-4-12-180147-0 （日语）. 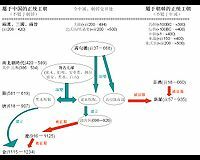 ^ Rhee, Song nai (1992) Secondary State Formation: The Case of Koguryo State. 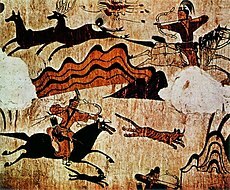 In Pacific Northeast Asia in Prehistory: Hunter-fisher-gatherers, Farmers, and Sociopolitical Elites, edited by C. Melvin Aikens and Song Nai Rhee, pp. 191-196. WSU Press, Pullman ISBN 978-0-87422-092-6. ^ 国史編纂委員会. 三國史記 卷第二十八 百濟本紀 第六. 国史編纂委員会韓国史数据库. ^ 国史編纂委員会. 三國史記 卷第十八 髙句麗本紀 第六. 国史編纂委員会韓国史数据库. ^ NAVER知識検索 원문과 함께 읽는 삼국사기 의자왕 義慈王. 韓国人文古典研究所. ^ NAVER知識検索 원문과 함께 읽는 삼국사기 광개토왕 廣開土王. 韓国人文古典研究所. ^ The War of Words Between South Korea and China Over An Ancient Kingdom: Why Both Sides Are Misguided "In exchange, the Koguryo leaders gained Han recognition of their status, along with various prestige items and access to Han trade. Koguryo leaders were otherwise free to exercise government over their people as they wished." ^ 《三国史记》记载："八年　冬十一月　汉以大兵向我　王问群臣　战守孰便　众议曰　汉兵恃众轻我　若不出战　彼以我为怯　数来　且我国山险而路隘　此所谓　一夫当关　万夫莫当者　也　汉兵虽众　无如我何　请出师御之　答夫曰　不然　汉国大民众　今以强兵远斗　其锋不可当也　而又兵众者宜战　兵少者宜守　兵家之常也　今汉人千里转粮　不能持久　若我深沟高垒　淸野以待之　彼必不过旬月　饥困而归　我以劲卒薄之　可以得志　王然之　婴城固守　汉人攻之不克　士卒饥饿引还　答夫帅数千骑追之　战于坐原　汉军大败　匹马不反　王大悦　赐答夫坐原及质山　为食邑"
^ 《三国史记》卷15：“二十五年　冬十月　扶余使来　献三角鹿・长尾兔　王以为瑞物　大赦...五十三年　春正月　扶余使来献虎　长丈二　毛色甚明而无尾...六十九年...肃愼使来　献紫狐裘及白鹰・白马　王宴劳以遣之"
^ 田景等. 《韩国文化论》. 广州: 中山大学出版社. 2010年5月. ISBN 9787306036575. ^ 杨雨蕾等著. 《韩国的历史与文化》. 广州: 中山大学出版社. 2011年6月. ISBN 9787306038999. ^ Christopher I. Beckwith, 2004. Koguryǒ: The Language of Japan's Continental Relatives: An Introduction to the Historical-Comparative Study of the Japanese-Koguryoic Languages, with a Preliminary Description of Archaic Northeastern Middle Chinese. Leiden: Brill Academic Publishers. ISBN 978-90-04-13949-7. ^ 88.0 88.1 88.2 88.3 88.4 88.5 88.6 韦旭昇著. 《韩国文学史》. 北京: 北京大学出版社. 2008年7月. ISBN 978-7-301-14042-0. ^ 宋成有 等. 《中韩关系史-现代卷》. 北京: 社会科学出版社. 2014年1月. ISBN 978-7-5097-5142-8. ^ 温家宝：中韩无领土问题 历史研究要讲两分开原则. 中国新闻网. 2007-04-06.